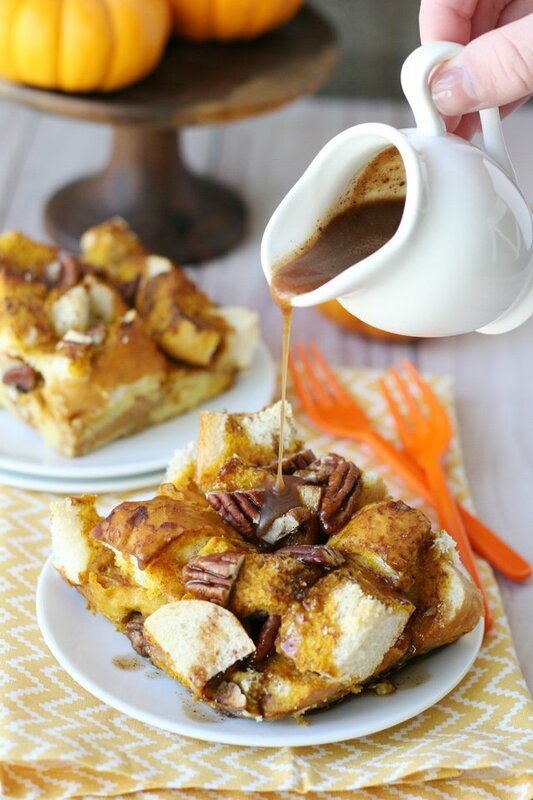 Pumpkin, cinnamon, maple… this Baked Pumpkin French Toast is filled with all of my favorite fall flavors! 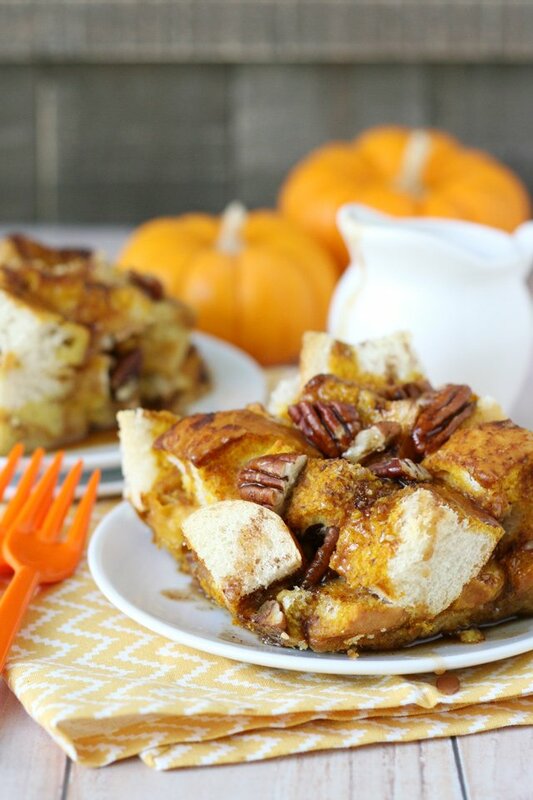 This is simply the perfect recipe for a special fall breakfast or brunch! 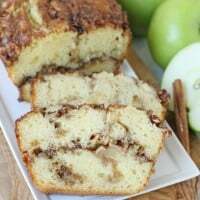 Prep the ingredients the night before, and simply bake in the morning for an easy and impressive treat that will fill your home with the fragrance of fall! If you happen to have any leftovers, this recipe stays fresh and delicious (in the fridge) for a day or two. Simply pop it in the microwave a few seconds and it’s just as good as the day it was first baked! This might be a breakfast recipe… but I assure you it’s equally delicious as an evening treat! 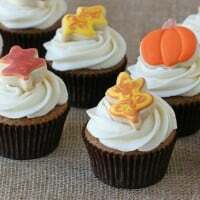 I created this recipe in partnership with Sprouts Farmers Market. I love visiting Sprouts with the change of each season… their seasonal products and displays are the perfect inspiration for fresh, seasonal recipes. 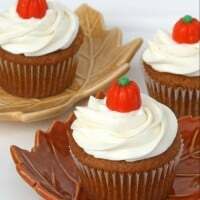 With the arrival of fall, Sprouts has all of my fall favorites on hand… pumpkin, pumpkin pie spice, lots of cute decorative pumpkins… as well as a full line of seasonal pumpkin products, from cookies to candies, to pumpkin butter and more! 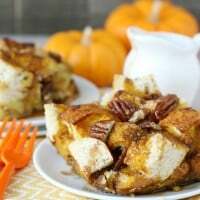 You’ll find all of the ingredients you need for this delicious Baked Pumpkin French Toast Casserole, and so many of my other favorite fall recipes. I’m not a huge fan of overly mushy french toast or bread pudding type treats… so this recipe is designed to create a dish that has plenty of texture. The base of each slice will be soft, and the top half will have some nice crisp pieces of bread. The pecans throughout the recipe also add some great texture and flavor! Don’t skip the maple topping… it’s one of my favorite elements in this recipe (and it might become your new favorite fall topping for pancakes and waffles too)! 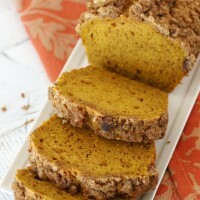 Simply the perfect fall breakfast or brunch treat! And the fragrance while this is baking is heavenly! Prepare a 9”x 13” casserole dish by lightly coating with butter (or cooking spray). Cut French Bread into large cubes (about 1” square). Add about half of the bread to the pan, sprinkle some of the chopped pecans, and then add the remaining bread. Reserve the remaining pecans (about half). 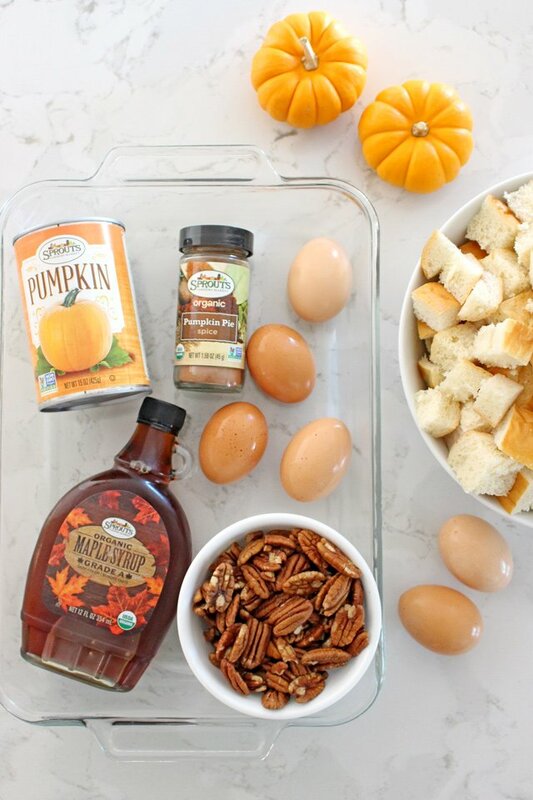 In a large bowl, whisk together eggs, milk, canned pumpkin, sugar, maple syrup, vanilla and pumpkin pie spice. Blend until fully combined. Pour the egg and milk mixture evenly over the pan of bread. 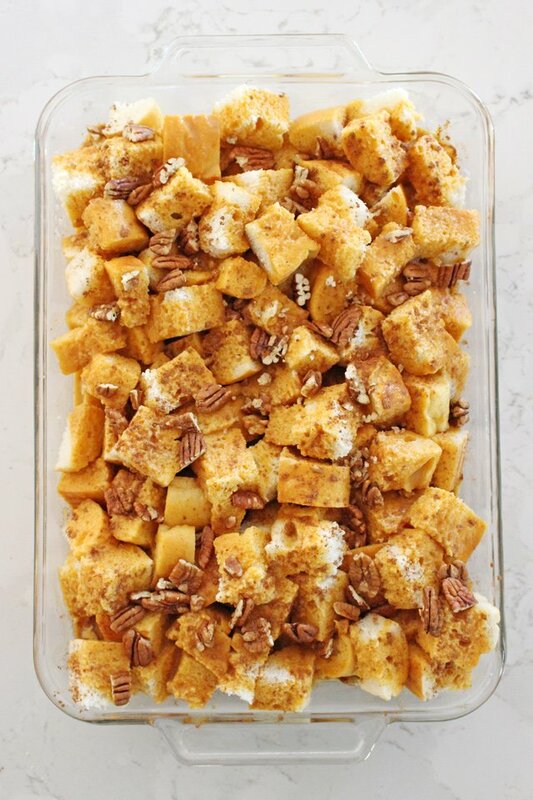 Add the remaining chopped pecans on top of the bread, and if desired, sprinkle just a bit more pumpkin pie spice over the top of the casserole. Cover, and refrigerate for at least 30 minutes (up to overnight). Press the bread down into the milk mixture just a bit, so most of the bread is kept moist. Bake, uncovered, in a preheated oven at 350°F. for 45-55 minutes or until the casserole is set, and the bread on top is golden brown. While the casserole cools just a bit, prepare syrup by combining maple syrup, melted butter and pumpkin pie spice in a small bowl and whisking well to combine. Before serving casserole, pour syrup evenly over casserole, or serve the syrup on the side and guests can add it to their own serving. If you don't have pumpkin pie spice on hand, you can make your own by mixing 1 teaspoon of cinnamon, 1/4 teaspoon nutmeg, 1/4 teaspoon ginger and 1/8 teaspoon allspice. Stir, then measure out as needed for the recipe. You can control how soft or crispy the finished dish is by adjusting the bake time, and how long you soak the bread before baking. If you prefer a casserole with more texture, then allow the bread to soak just 30 minutes before baking (and not overnight). To save prep time in the morning, you can prepare the ingredients the night before by cutting the bread and placing in a plastic bag, chop the nuts and set aside, then prep the milk & egg mixture and store in a sealed container in the fridge overnight. In the morning, simply assemble, allow to chill 30 minutes and then bake. Oh, Glory . . . seriously . . . can I pretty please just move in and be another one of your taste tester minions? ? ? 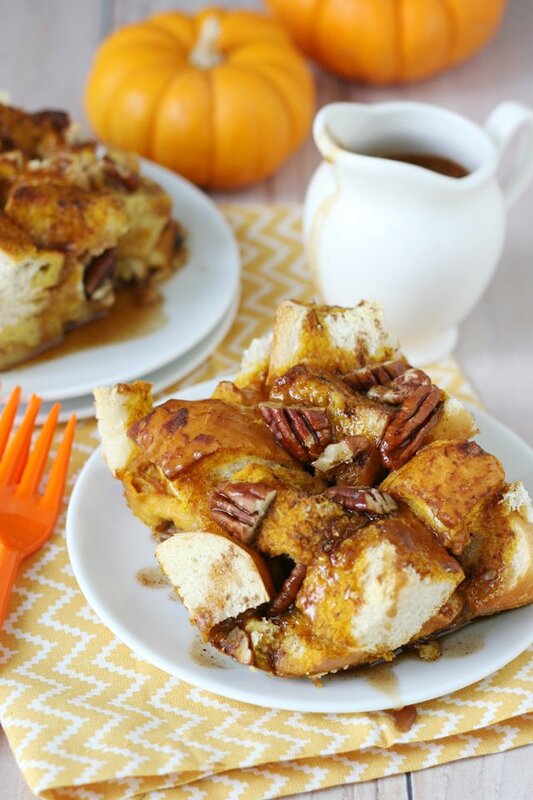 This would be a perfect fall breakfast! Oh my goodness. I am going to have to try this. It looks delicious. My husband would go crazy if I got up in the morning and made this. Congratulations on your blog, it’s beautiful, informative, and have been inspiring me a lot.